Live Views were a new introduction to Hotmail in Wave 4. In a nutshell, a “Live View” is a better way to visualize certain parts of an email message. If someone sends you a link to photos on Flickr or a video on YouTube - the email isn’t about the link, its about the content the link represents - Basically - Hotmail looks at the content of email and finds useful ways to display your mail in rich engaging ways without having to leave the inbox. This is one of the most significant features for the entire release, and Hotmail won rave reviews not only for the technical aspects of the feature but for its design, and the way that it dovetailed cleanly with the rest of the mail experience. 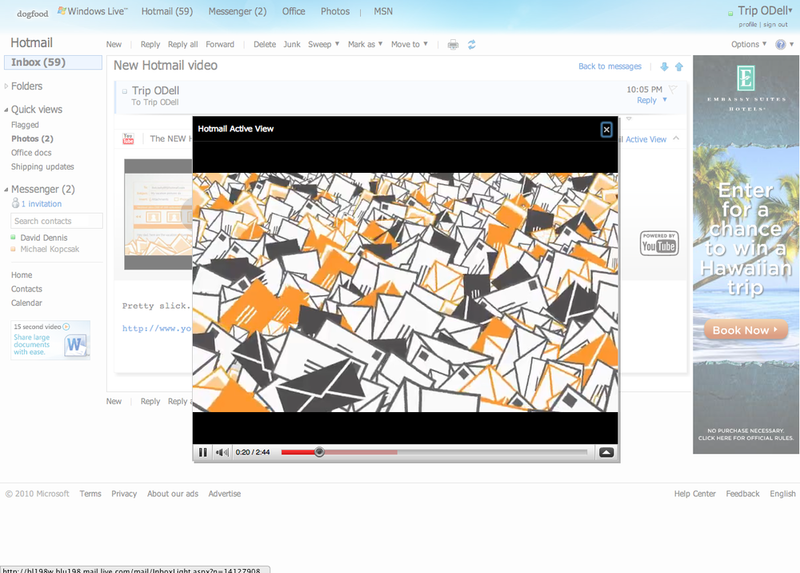 My work on this feature influenced other areas of the Hotmail and Windows Live UI -Including the way attachments are reflected in the read view of mail.